The UK's Bentley Drivers Club is celebrating its 60th year of racing at Silverstone with its first ever two-day meeting, on 8th to 9th August 2009. Everything from Vintage Bentleys to modern-day machines will take to the track in this, the 60th anniversary of the Club’s first Silverstone race meeting – honouring a continuous run of annual BDC events at the circuit, from 1949 to the present day. Among the highlights at the 60th Anniversary Meeting will be the traditional Bentley handicap race, a unique feature of BDC meetings and a firm favourite with both participants and spectators. 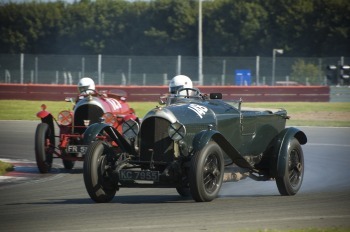 The handicap race allows Bentleys of every era to take part in a genuinely competitive battle for victory. Since each car is started from the pit-lane, a 1925 Bentley 3 Litre might have a full two-lap head start on a more modern Turbo R, and the race is on – right down to the chequered flag. Equally popular is the Bentley Drivers Club ‘All-Comers’ race. Here, as well as a large helping of Bentleys, you can expect to see cars varying from a humble Lotus Sunbeam or Triumph GT6, through to a modern McLaren or Lola T70. Meanwhile, there will also be the traditional Bentley Parade on the Saturday, which invites any club member who turns up in a Bentley, new or old, to drive three laps of the Silverstone circuit – topped off by a taste of ultimate performance, with a track demonstration of the 2003 Le Mans-winning Bentley Speed 8. Off-track, spectators can wander through an impressive display of significant Bentley race cars, including past Le Mans winners, Brooklands cars, and Bentleys that have raced at BDC events throughout the past 60 years.